In the year 2010 AD, Hyper Hurricanes born concurrently all over the world caused severe damage. Five billion people lost their lives, decreasing the world's population to 3 billion. Existing economies and militaries were wiped out. Countries were frozen under solid ice, plains sank beneath seas, the world was changed dramatically. Human civilization enters a chaotic era. Poverty flourished outside of these ecomomic zones and slums were widespread. The ruling class called themselves Logos and maintained their position by force of arms. They call the poor Revenus, who are exiled to live outside the special economic areas. Time has passed since then. Katsuragi Jo and Tsurasawa Jin, escape from Phantom, a force organised to watch Revenus and to suppress renegade elements of the Logos, taking with them a mysterious girl, Noto Sana. There are many who are interested in her, all with their own reasons. 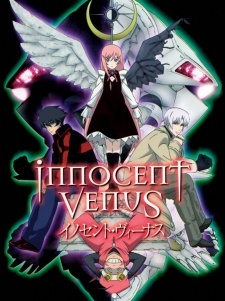 Watch Innocent Venus Episodes Online at Animegg.org. Innocent Venus is available in High Definition only through Animegg.org. Choose an episode below and start watching Innocent Venus in Subbed & Dubbed HD now.